The area surrounding Muskogee, Oklahoma has turned into a motorcycle magnet where blacktop curves are paired with inspiring scenery. So gas up and hit the road to explore these five loop tours loaded with sparkling lakes and rolling hills perfect for motorcycling adventures. A view from one of the vista turnouts on the Talimena Skyline Drive in southeastern Oklahoma. This scenic route draws motorcycle enthusiasts from across the country who enjoy its winding curves. Sometimes you've just got to get away from the regular grind of career, errands and obligations for an escape to a place where you can clear your head and concentrate on enjoying the moment. When that time comes, don your favorite riding gear and head to Muskogee where you can get lost in the twisting asphalt, the kick of acceleration, the sound of your engine and the wind in your face. The folks at the Greater Muskogee Area Chamber of Commerce & Tourism office have mapped out five intriguing motorcycle loop tours ranging in length from 50 miles to over 200 miles. Whether you prefer roads that hug the shores of lakes and rivers or routes that help you discover historic outlaw hideouts and battlefields, you're sure to find a ride perfectly suited for you among these tours. This sweet little trail will wind you north of Muskogee on Highway 16 to Highway 51 where you'll cross beautiful Fort Gibson Lake, one of the best places in the region to watch a sunset. Pack a picnic supper and stop to enjoy the evening along the way with someone special. Then let the lake breeze ease the tensions away as you marvel at the majesty of an eagle soaring above its nesting grounds. Catch Highway 80 and head south along the shores of the lake where you can venture just off the highway and find yourself twisting through the towering pines of Sequoyah State Park while catching a glimpse of deer, turkeys and other wildlife. Then roll through the historic town of Fort Gibson and take Highway 10 back into Muskogee. This tour takes only about an hour to ride, so there's plenty of time to slow down and enjoy the view. Put your knees in the breeze for this ride that will take you into the territory of infamous outlaws like Belle Starr, the James Brothers and the Cook Gang. As you head south out of Muskogee on Highway 69 you'll motor towards Lake Eufaula, Oklahoma's largest lake. Along the way, a side excursion to the Honey Springs Battlefield in Checotah will interest Civil War buffs. Sweet shopping deals, casino gaming and hometown restaurants might make you linger a little longer in downtown Eufaula on the shores of the lake. As you leave Eufaula, point your motorcycle east on Highway 9 and and zip over to Porum on Highway 71 where the bullet holes from a cattle range war can still be found in an old barn or two. From Porum, head north on Highway 2 and junction with Highway 64 heading east. From there, a shaded and winding Highway 10 will lead you through part of the historic Cherokee Nation and right back into Muskogee. It takes almost no effort to imagine the hideouts and shootouts that were once a common part of these hills. Greenleaf State Park is a popular stop along Highway 10 where you can fish, hike, stay in historic cabins or just enjoy the lake views and scenery. Set in the heart of Oklahoma's Green Country, this motorcycle tour shows just what has earned the region this nickname. The sparkling waters of lakes, creeks and rivers nourish lush greenery along your route and keep the ride anything but dull. Begin in Muskogee and ride east on Highway 10 to the town of Fort Gibson where you can visit the first Army post built in Indian Territory, the Fort Gibson Historic Site and Interpretive Center, and pay homage to heroic veterans from the Revolutionary War through the Persian Gulf War at the Fort Gibson National Cemetery. When you're ready to hit the road again, take Highway 80 heading north where you'll ride along the shores of Fort Gibson Lake and near Sequoyah State Park. Drive east on Highway 51 which will lead you into Tahlequah, the capital of the Cherokee Nation. Take a break to stretch your legs and explore this historic town where the street signs are in both English and Cherokee. Sink your teeth into an amazing pizza pie at Sam & Ella's Chicken Palace and savor the flavor of favorites like the Rock Island Red or the Pie Without A Face in the restaurant where Carrie Underwood waited tables during her college years. Tour Diligwa, a 1710 Cherokee Village, at the Cherokee Heritage Center where you'll learn to shoot a blowgun, play stickball or fashion arrowheads out of rock. Jump back on your bike riding north on Highway 82 until you junction with Highway 412 and turn east. Turn back south on Highway 10 and enjoy one of the most scenic motorcycle rides in Oklahoma as you snake through twists and turns nestled between rocky bluffs and the Illinois River. If you ride this route during the summer months, you'll find several float outfitters along the river offering canoe and raft trips. Pick up Highway 82 south and meander alongside Lake Tenkiller making sure to stop by Tenkiller State Park for a little lake fun. Continue on to Vian where you'll take Highway 64 west to Highway 10 which will lead you back north into Muskogee. Bootleggers were no strangers to this area which was supposed to be dry during Prohibition, but in actuality was anything but. Cowboys would slip flasks into their boots to smuggle the contraband liquor in from Arkansas. The back roads between Siloam Springs and Muskogee were well known to young men who earned extra cash by running moonshine. The Cookson Hills, picturesque and peaceful today, hid many a copper still that kept revenuers up in arms in the past. Today, this road still has a little bit of that rebellious attitude and the Cherokee Hills still stir the spirits of motorcycle riders who journey here. To follow this route, head east from Muskogee to Tahlequah where you'll join up with Highway 82 going north. Motor alongside Lake Hudson to the town of Salina and then catch Highway 20 north to Langley visiting Spavinaw Area at Grand Lake State Park or the Cherokee Area of Grand Lake State Park for a healthy dose of natural beauty. It's a short ride east on Highway 28 to the junction of Highway 59 where you'll turn south and cruise the scenic twists and turns to 59/412. Park your bike and hike to the base of a 77-foot waterfall at Natural Falls State Park where parts of the movie Where the Red Fern Grows were filmed. Just down the highway from Natural Falls is the Cherokee Casino at West Siloam Springs featuring 50,000 square feet of casino gaming thrills, Twisters bar and a delicious menu at the Sidewalk Cafe. After a break for a little nature and a chance to try your luck at the casino, climb aboard your motorcycle and ride south until Highway 59 meets Highway 62 where you'll head west back to Muskogee. Adventure awaits you on this road where every mile is a delight. Exhilarating ribbons of pavement wind through ancient mountains that step higher and higher in smoky blue layers that stretch to the horizon. You're in Choctaw country now, an area known as "Little Dixie" for its politics, its southern comfort food and its unmistakable hospitality. This ride to remember starts as you head east on Highway 16 out of Muskogee and junction with Highway 10 heading south where you'll wind alongside the Arkansas River. Roll through Greenleaf State Park and then swing east onto Highway 64 until Highway 59 takes you south. In Poteau you'll pass Cavanal Hill which has been dubbed the "world's highest hill" at 1,999 feet above sea level - just one foot short of official designation as a mountain. Linger in Poteau to enjoy the savory fare at Warehouse Willy's, which has earned a reputation for serving up some of the best steaks and Cajun cuisine in the region. 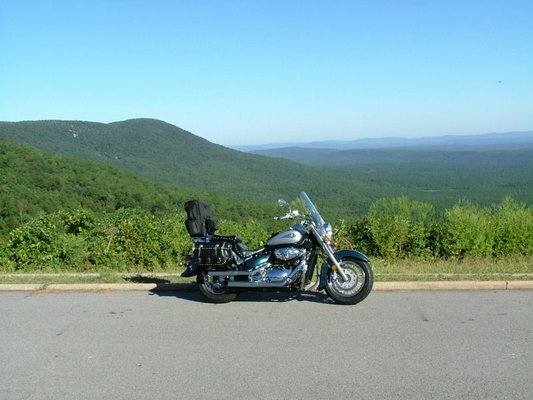 Continue south on Highway 59 as it winds deep into the stunning Ouachita National Forest and prepare for one of the most motorcycle-friendly stretches of highway in the country as you turn west onto Highway 1. Known as the Talimena National Scenic Byway, Highway 1 offers endless panoramic vistas as the ridges of the Ouachita Mountain range stretch to the horizon and the curvaceous little road snakes over the tops of the ancient mountains. The scenery just keeps coming as you reach Sardis Lake and turn north onto scenic Highway 2. A stop at Robbers Cave State Park near Wilburton is a must. Infamous outlaws including Belle Starr once hid out in the cave tucked away in the Sans Bois Mountains of Robbers Cave State Park, but now visitors enjoy hiking, horseback riding, rock climbing, rappelling, fishing and camping in this scenic spot. After your park visit, continue north on Highway 2 then follow Highway 71 and pick up Highway 64 at the I-40 crossing to head back into Muskogee. No matter which of these routes you choose to explore first, you're sure to enjoy your Muskogee area motorcycling adventure. Stay in a Muskogee hotel or bed & breakfast inn, make the town your hub and try all the routes for an incredible week of rides and good times. In Muskogee, you'll find a diverse array of attractions from casino gaming to Native American museums and even a World War II submarine to keep you busy and entertained for days. A ride through beautiful Honor Heights Park is a necessity. If you happen to be there during April, you're in for a real treat when the park comes alive with color during the annual Azalea Festival, or cruise the park during the holidays to behold the 1.2 million sparkling lights of the Garden of Lights display. Search our full list of Muskogee attractions for more ideas.